From Rendezvous Bistro in Jackson Hole, WY chef Roger Freedman and Bon Appetit October 2011, Scallops and Oyster Mushrooms with Soy-Ginger Butter. I used a mix of crimini and shiitake mushrooms instead of oyster mushrooms to save a little bit of $. Not really Asian, or American, but good product and flavor make a good dish. Two sub-recipes are a soy-lime-wasabi vinaigrette and the soy-ginger butter sauce. 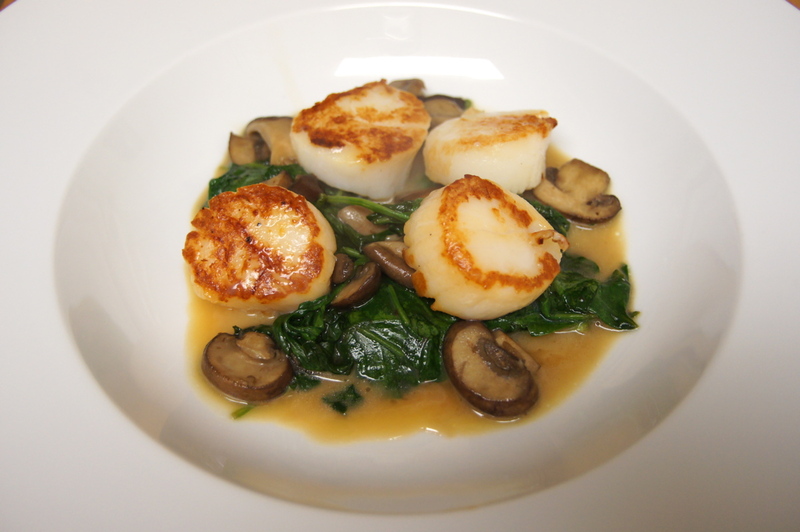 Once those are made, the final preparation is an easy saute of mushrooms and spinach, and a quick sear of the scallops.